The episodes usually have a theme tying everything together (I think that one was start-your-day-with-a-coronary), ranging from global food to meat madness, seafood to sandwiches. Each eatery (it’s easier to type than Diners Drive-ins and Dives every time) is independent, and often has an odd quirk, and always a killer menu. *I think at about this juncture I should apologise for the language used in this blog update. 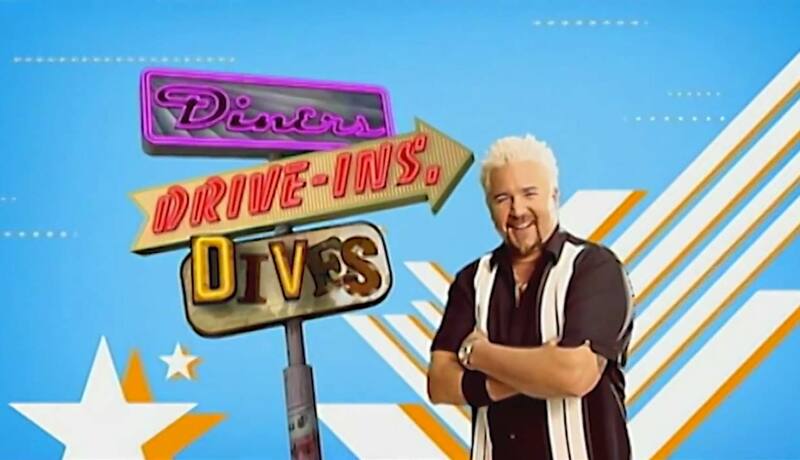 Watching the show as often as I do means that I slip far too easily into Fieri’s addictive patter. All of a sudden delicious dishes are “money”, everything is “killer”, and if an ingredient blows my mind then it’s “a one way ticket to Flavourtown”. The food always looks delicious, and Fieri treats all the chefs and owners with the respect that only comes from having done it himself. Most of the cooks featured are not trained chefs, but just had a passion for food and decided to open a restaurant. A lot of the food seems to us Brits to be ridiculous – the portions are huge, certainly, and an awful lot of butter is used – but maybe that’s part of the fascination. We have a mental map now of these fantastic-looking restaurants all across America that we HAVE to visit. There’s a pizza place in Chicago where the walls are covered in musical instruments; a diner in Hyde Park, NY where they not only serve a full diner menu, but make hundreds of cheesecakes and pastries per day; there’s a hotdog store in Minneapolis called The Wienery. I’m just going to let that one stick in your mind for a bit. Wienery. Fieri went to all of these places and showed the enthusiasm that the owners have for their food, and that’s rubbed off on me to the extent that I am seriously considering putting a flat grill onto a trailer and cooking burgers at markets. He makes it look fun! The one problem I have with this programme is that everywhere is described as selling ‘home-cooked food’. All the customers say that they go to these restaurants to eat this ‘home-cooked food’ without realising the irony of their statement. It’s not home-cooked. It’s restaurant-cooked. If you want home-cooked, go home and cook. It won’t be as “money” as the food on Triple D, but at least you won’t be making a fool of yourself in front of a camera. If you want to catch the show for yourself, it’s on Freeview channel 49 at 8, 9 and 9.30pm every weekday.